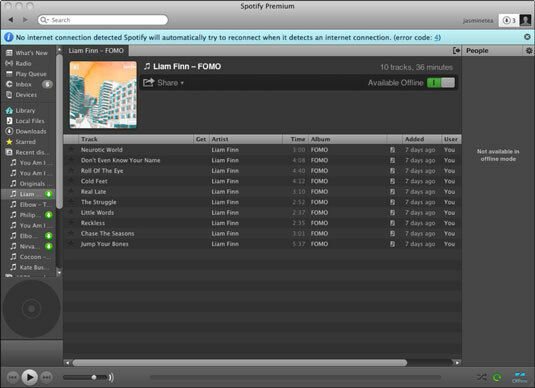 To use Spotify’s Offline mode, you mark a playlist as being available offline, rather than individual tracks. There’s no limit to the amount of playlists you can make available offline, as long as the combined total tracks are within the 3,333 limit. Nor are you restricted to syncing only your own playlists: There’s nothing stopping you from making a playlist you’ve subscribed to available offline, too. Select the playlist you want by clicking its title in the Spotify window’s left sidebar. 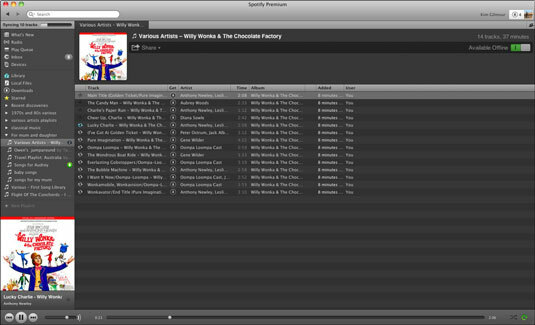 The playlist’s tracks appear in the main Spotify pane. At the top-right, click the Available Offline option to flick the switch to the On position. Alternatively, right-click (Ctrl-click on a Mac) a playlist name in your left sidebar and select Available Offline from the pop-up menu that appears. The switch turns green, and songs now start syncing to your computer. Spinning arrows next to each track let you know that the syncing process has started, while a progress bar at the top of the left sidebar also tells you how many songs you have left to sync. The time it takes for songs to sync varies — if the music already happens to be in your cache and you’ve been frequently listening to it, then it might take only a couple of seconds for each track. But if it’s something you’ve never previously heard, it largely depends on your broadband speed. Should you need to shut down your computer or go offline before the syncing process ends, don’t worry. Syncing resumes when you start Spotify again. You also can listen to songs that have synced so far, even if you don’t have a live Internet connection. When songs have successfully synced, a symbol consisting of a green circle with a white arrow on it appears next to the playlist name. If a playlist sync has only partially completed, you see a gray circle with a white arrow on it, instead (the icon is not to be confused with the similar-looking symbol that’s used for downloading tracks, which appears next to the track name, rather than the playlist name). You can always drag more tracks into an offline playlist. Whenever you do, Spotify starts syncing it, as long as you’re online. You see the usual onscreen indicators, including the spinning arrow and the progress bar, while it happens. You can listen to other songs and browse Spotify as normal during syncing. When you’re using Spotify’s desktop software — that is, the application that you install on your main computer, as opposed to your mobile device — you can’t manually force it to go into Offline mode while your other programs (such as your e-mail program or Internet browser) are still connected to the web. But if you switch off your wireless connection or disconnect your computer from your modem, causing your entire Internet connection to be cut off, then Spotify detects you’re not online and operates in Offline mode. The Spotify window shows various alerts to your offline status: a broken symbol at the bottom-right of the window; a message above the main pane alerting you to the fact that Spotify can’t detect an Internet connection and will keep trying until it does; and the People sidebar that usually lists all your contacts informing you that it’s unavailable in Offline mode. Whenever you’re in Offline mode, Spotify operates as normal, apart from the inability to search and stream live songs from Spotify’s library and view your People list. You can always listen to tracks you’ve synced. You also still can listen to all your local files (the songs you already own as digital files, such as MP3s). So, why can’t you isolate the Spotify software to make only it, and not your other programs, go offline? Spotify needs your available Internet connection to help distribute its tracks all around the world to other users by using peer-to-peer technology. If it were too easy to make Spotify go offline, it would be cutting valuable resources off from everyone else.